One of the most often used and abused post processing tools are the sharpen filters. When applied properly, sharpening can boost the image by making it look crisper and more defined. However, there is a tendency to go overboard with this and the image can come out looking unnatural and ‘oversharpened.’ There is the popular misconception that if you sharpen a blurry image, it will magically appear clearer. What does happen is that the blurry image will just look more terrible. Sharpening works by exaggerating the contrast of the object’s edges, giving the viewer the impression of distinct delineation. There are many ways to do this. You can sharpen the entire image in one click with the Sharpen filter or you can use the Unsharp Mask for more control over how defined you want the sharpening to be. Some people prefer to use the High Pass Filter or the Smart Sharpen. Whichever method you use, just remember to be light-handed when sharpening since too much can make the image look unnatural with distorted pixels. One tip would be to sharpen only certain areas in the shot instead of the whole image. For example, if your image is of a bird flying against the cloudy sky, sharpen only parts of the bird while leaving the sky untouched to keep it looking smooth. When editing your image, always leave sharpening for last. Sharpening in the middle of editing is not advisable especially if the image might be resized later on. For full effect, do it when you have settled on the final size of your image. If you’re planning to sell your shots in a stock site, try not to sharpen your images at all. The buyers of your image might want to resize the shot and if there is obvious sharpening, they might be turned off from buying the image. 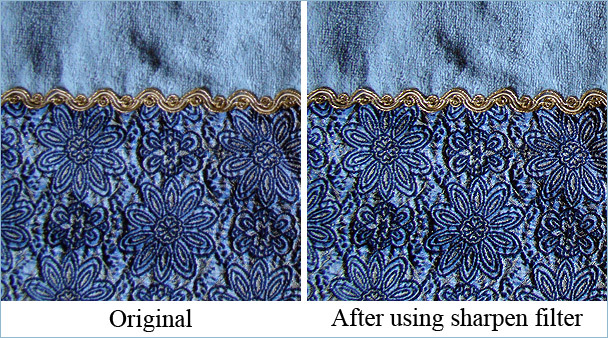 Microstock sites have reviewers who peruse every single image that is submitted for possible photographic defects. They are very particular with photos that look too sharpened and I have had shots rejected because of oversharpening even though I hadn’t sharpened them at all. Sharpening might not make blurry images clearer but it can make images with soft edges appear better defined, and this can make a world of difference in your shot. Radius – this defines the section to be sharpened. If you choose a low radius, only the pixels close to the edge will be sharpened and if you use a high radius, the larger the affected area. If you start seeing unsightly halos around the edges, it means you’re setting the radius value too high and is an indication to decrease the radius value. Amount – The edges of details have a lighter and a darker side and this setting controls how much contrast is applied. The light areas become lighter and the dark parts become darker when you increase the percentage amount. 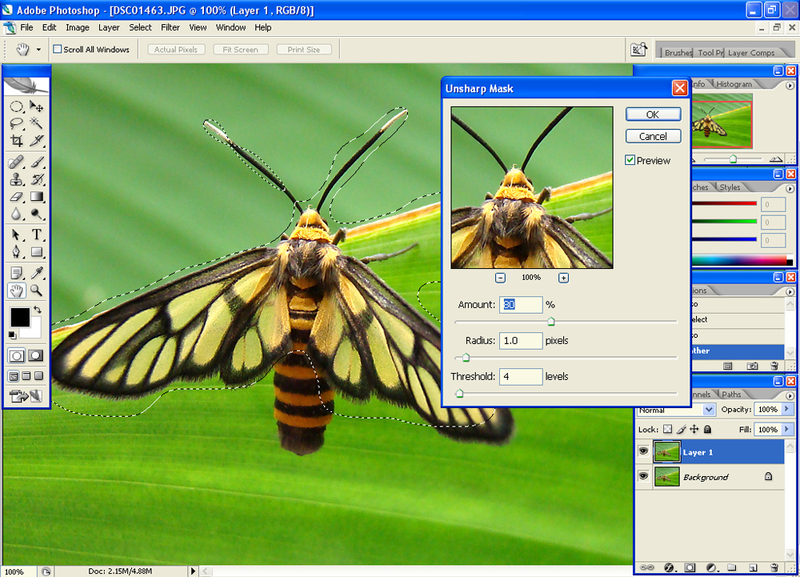 Threshold – this limits the amount of sharpening that is applied to the image by determining how close pixels should be in order to be considered as edge pixels. If there is little difference between pixels in a certain area, such as skin tones or an empty sky, then the threshold can be set to leave these areas from being sharpened. The settings to be used vary with each shot. Image size plays a big part in this case. For an image with a small print size, you would not need to increase the settings by a big margin before the result quickly becomes apparent. The bigger the image size, the more you can increase the setting values. For this tutorial, Adobe Photoshop CS2 is used. 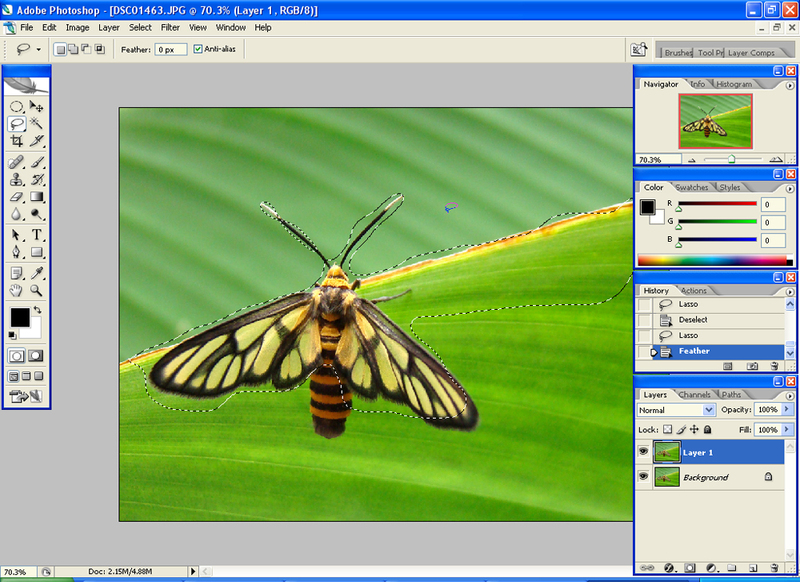 Open a copy of your original image and create a duplicate layer. A keyboard shortcut to create a layer is Ctrl + J for Windows and Command + J for Mac. Make a selection using the Lasso tool. 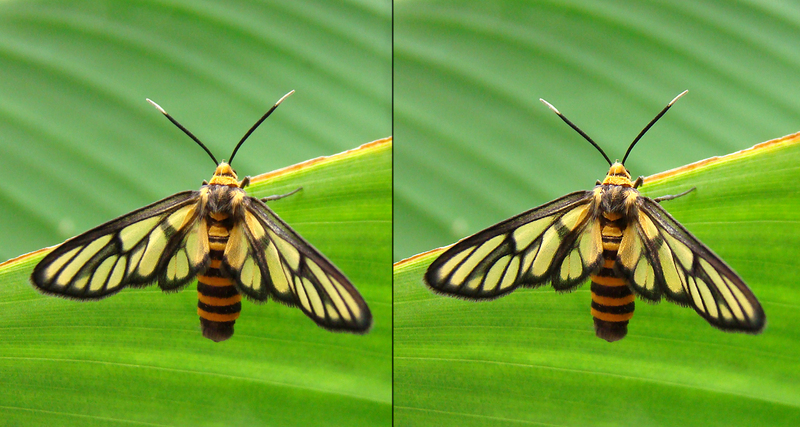 Choose only the areas that need sharpening and leave the rest of the image untouched. 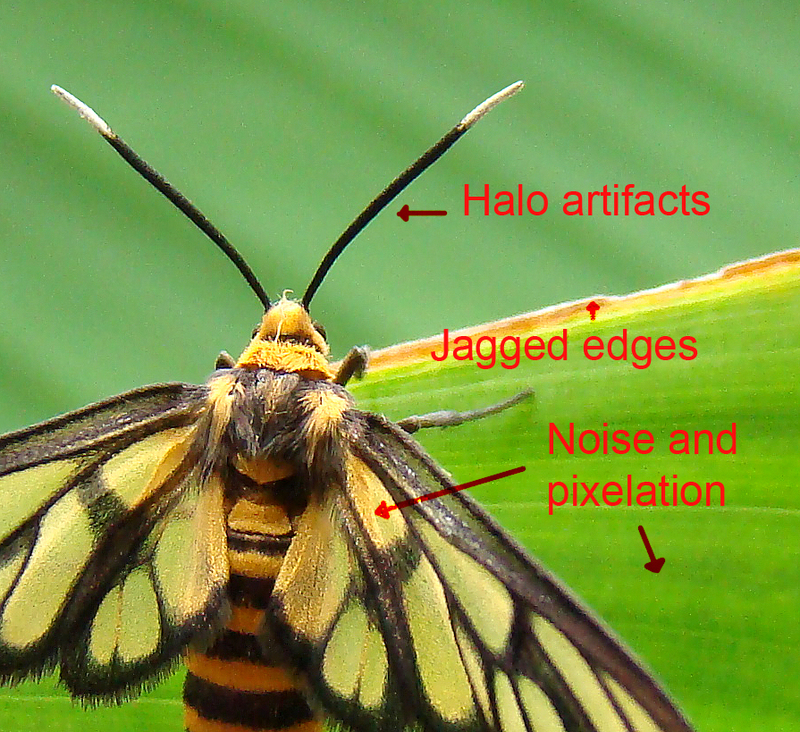 In this example, only the bee’s wings, antennae, upper part of the body and the edge of the leaf were selected. Open the Unsharp Mask dialog box under Filter>Sharpen>Unsharp Mask. The box shows a preview of a selected area, the three settings and the preview checkbox. If you check this, you will also get to see a preview of how your adjustments will affect the image in the main screen. If it is your first time to use the settings, you can experiment first with how they work. Try dragging each slider one at a time to the opposite side of the bar and, although the effect will be exaggerated, you will have a good idea of how each one will affect the image. What happens if you go overboard with the Unsharp Mask? Unattractive and obvious effects begin to happen. If your radius value is set too high, halo artifacts begin to appear. These are very light and bright outlines near the edges of details. Jagged edges and pixelation might also occur along the edges. There is more visible noise and graininess which is most evident if you oversharpen sections with no edges. This is the reason why none-edged areas are too be avoided when sharpening. This entry was posted on Saturday, October 12th, 2013 at 10:29 am	and is filed under Articles, Beginner Tutorials, Photography Tutorials, Photoshop Tutorials. You can follow any responses to this entry through the RSS 2.0 feed. You can leave a response, or trackback from your own site. This was a great read and refresher since sometimes one tends to go overboard with key values such as this sharpening. very interesting key point mentioned and easy to follow with the illustrations.